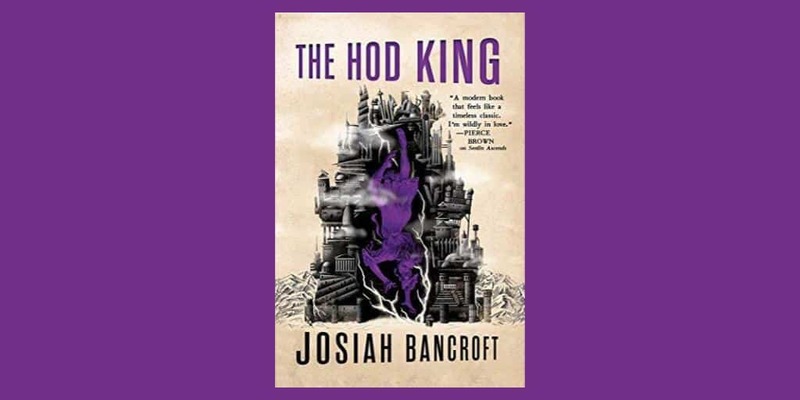 The Hod King Review: Josiah Bancroft's Best in the Series Yet | Nerd Much? I was drawn in by the unusual world in Josiah Bancroft’s The Books of Babel from the start. The premise is absurd—a tower of unknown height that contains millions of citizens in an unknown number of “ringdoms.” No one is sure how this tower is built or how old it was. Journeying through this tower—usually upward, sometimes downward—is Thomas Senlin, a school teacher who became separated from his wife, Marya, within the first few hours of their visit to the Tower. The penultimate installment in Bancroft’s quartet brings Senlin closer than ever to completing his search—to the high society of Pelphia, where his wife has remarried the charming and influential Duke Pell. Senlin, recently recruited by the enigmatic individual known as The Sphinx, does not visit Pelphia with strictly personal motives. The Sphinx, who is responsible for much of the Tower’s maintenance and keeping energy flowing through its numerous ringdoms, sent Senlin to Pelphia to investigate the purpose of its Colosseum, whose main attraction is its brawls between the slaves of the Tower, known as hods. At the same time, the Sphinx sent the rest of Tom’s former crew—Edith, Iren, and Voleta, along with the Red Hand and the Sphinx’s assistant, Byron—on his legendary airship, The State of the Art to tour the tower and announce the return of the Sphinx. Voleta is tasked with approaching Marya from a different angle, while Edith takes the role of captain and acts as the voice of the Sphinx as she meets with dignitaries from Pelphia. The book is divided into different parts that tell the stories of the protagonists concurrently. This results in a story that easy to digest but becomes somewhat slow by later parts of the novel. However, Bancroft’s writing is as strong and colorful as ever, depicting a Tower that is rotting from the inside out while still showcasing its wonders. Thomas Senlin is one of my favorite fictional characters of all time. Thomas Senlin is one of my favorite fictional characters of all time. He is unpredictable and dynamic, yet he holds on to a few core tenets—his natural trust in others and in humanity, and his will to persevere—no matter what his situation is. Senlin is massively flawed, and often reckless, but he is also easy to root for, even as he causes mayhem (and death) during his wild search for his wife. The first part of the book primarily follows Senlin as he navigates Pelphia in disguise, trying to get as close to his wife as possible. The Hod King starts off at a breakneck pace—this is the sort of book that throws events at you that you didn’t anticipate happening until the climax. However, this initial impression doesn’t ring true by the 2/3rds mark in the story. When the focus shifts to Voleta and Iren, we are sent back a few weeks in time to follow their adventures while Senlin was pursuing his wife. When the focus shifts a second time to Edith, we are sent back even further than that, to when Edith is preparing to become the captain of The State of the Art. I would have preferred more Senlin—his part of the story has always been the most interesting to me, and this is his most interesting chapter yet. However each chapter feels like a punchy novella, each with its own climax—and their stories come together satisfyingly in the end. One difference that sets this third entry apart from the first two is that it is much less about exploring the wonders and horrors of the Tower. While a few parts of the Tower are introduced that haven’t yet been shown directly, Pelphia and its gilded society is the primary setting. Bancroft firmly established the series as an ensemble tale in the second book, The Arm of the Sphinx. Now, with several protagonists with complicated histories and struggles we care about, he can shift the focus of the story without us feeling like we’re missing too much of the action—even if more Senlin wouldn’t have hurt. The Tower is on the brink of war, and you see it at all levels of society—the vain nobles of the Pelphian court, the Sphinx’s desperate attempt to reassert control, the revolution of the hods and their mysterious Hod King. Despite the segmented storytelling, The Hod King is my favorite entry in the series yet, overcoming the sluggish plot of The Arm of the Sphinx while deepening the already complex relationships and firmly propelling Senlin toward the final leg of his journey.